New tool 1:48th Bf-109E? Hmmm, from Airfix? Yes, that’s worth paying attention to isn’t it? It was certainly enough for me, and that box art…. Wow! I didn’t think that I would ever be able to say it again, but Airfix has stolen back its crown as the premier standard in kit box top artwork. In the dark days when Hasegawa were sitting pretty with Koike Shigeo riding rampant with stunning artwork on their boxes, Airfix were a shadow of their former selves from the 1960s and early seventies. All that has changed, with Hasegawa often resorting to photographs of the real aircraft, we now have with the new Airfix kits some of the best branding seen in years in this great hobby of ours (ah… and rest…). A box remarkably full of grey sprue, appearing rather more in total than I remember putting together for my Tamiya and Hasegawa Bf-109s some years ago, so it’s looking promising! 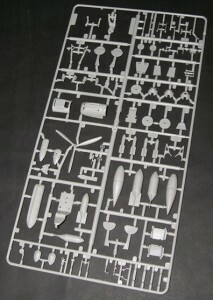 Two large grey sprues house all the main parts with the usual separate clear sprue tree containing clear parts. The plastic has a better feel to it than in some past releases, less powdery, quite smooth and on the softer side of hard. Having built the Harrier GR-7 recently (see your Finished Now area), this plastic is very similar and is easy to trim, sand and work with. Panel line detail is recessed and in 1:48 scale looks pretty good to me, better in this scale looking more realistic than the slightly heavy engraved detail on some 1:72 kits. Getting better all the time! One thing you immediately notice that Airfix has moulded the Daimler Benz engine at all, in this instance being an integral part of the forward fuselage. The basics are there in terms of detail and the engine cowl is moulded separately so that you can add and remove the cover at will – a nice touch. Three different types of spinner are included and that’s excellent, enabling you to complete several more options from your decal store. The tropical filter is also included that when used with an appropriate spinner will enable you to build an E-7 – very impressive.